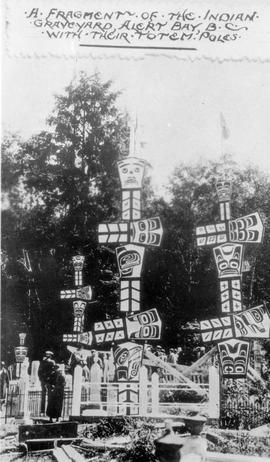 "A fragment of the Indian graveyard, Alert Bay, BC, with their totem poles." 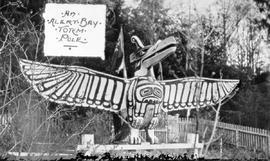 "An Alert Bay totem pole." "Chinese Cemetery; Feasting the Dead." "E. Pauline Johnson monument, Stanley Park, Vancouver"; Pauline Johnson's gravesite. "Esquimalt Royal Naval Cemetery"; plot plan. "First Office in charge was Captain George Bazalgette of the Royal Marines"; San Juan Island burial marker. "Gillespie E. Stephenson, died Oct . 9, 1909, aged 28 years, native of Quesnelle Forks, BC." "Grand Masonic Ball in Honour of the Occasion of the Laying of the Foundation Stone of the Masonic Cemetery"
Ticket of admission for July 30, 1872. "In Memory of Chartres Brew...."; Barkerville cemetery. "In Memory of John Jackson Died on Feb 3, 1900." "In Memory of Lady Franklin Died 18 July 1875"; and "Sophia Cracroft the devoted and attached niece of Sir John Franklin...". "In Memory of Mother, Aged 50 Years"; Indian graveyard at Mile 974.2 of the Alaska Highway. "Indian grave at Fort Selkirk on the Yukon River." "Street scene, Port Simpson, BC". "Sutlej" Monument - Erected to the memory of the Officers and Men who died during a four years commission in the Pacific. "The Great Bird on the Gallows Above the Graveyard." "Totem poles and cemetery, Kitwancool BC." A Maori grave near Waitara, Taranaki. A cemetery full of wooden burial markers. A grave at Wrangell, Alaska.